Height 5 feet 10¾ inches. Weight 170 lbs. Chest measurement 36-40 inches. Complexion dark. Eyes brown. Hair brown. Sight, hearing & colour vision all normal. Limbs well formed. Full & perfect movement of all joints. Chest well formed. Heart & lungs normal. Teeth good. Free from hernia, varicocele, varicose veins, haemorrhoids, inveterate or contagious skin disease. Vaccinated. Good bodily & mental health. No slight defects. Accepted. Job Jefferies, born on 12 October 1889 at Timaru, was the third son of William Jefferies and his wife Ada née Cullimore. The family moved from Timaru to the Westport district at some time after Job’s birth and before 1892. There his mother was gazetted as a registered midwife. Job and some of his brothers were bushmen at Kongahu, a forestry area near Westport; Job had also engaged in survey work. Volunteering for the 5th Reinforcements, Job enlisted on 12 February 1915, a single, 25-year old labourer for the Public Works Department, residing at Kongahu, Westport. He nominated his father, also of Kongahu, as his next-of-kin. He was a well-built man, standing at 5 feet 10¾ inches and weighing 170 lbs. Both Job and his brother Harry were adherents of the Salvation Army. He embarked on 13 June 1915 from Wellington with the Canterbury Infantry Battalion of the 5th Reinforcements, destined for Suez, Egypt. From September 1915, not long after he arrived at the Dardanelles, he had a rather torrid time, and consequently saw little action. He was admitted to No. 16 Casualty Clearing Station at Anzac on 5 September 1915, suffering from enteric contracted at Gallipoli. Five days later he was transferred to St David’s Hospital, Malta, disembarking from the hospital ship Neveralia on 10 September, slightly sick. Five more days and Private Job Jefferies, 6/2173, was moved to England where he was admitted to the Second Western General Hospital at Manchester on 23 September. From there, following his recovery, he was discharged to the New Zealand Convalescent Depot at Hornchurch. It was May 1916 when Job proceeded overseas to France and rejoined the Canterbury Infantry Regiment on 7 July 1916. Just nine days later he was wounded in action, suffering a severe gunshot wound to his left shoulder and a fractured clavicle which necessitated admission to the No. 14 Stationary Hospital at Boulogne. Within a few days he had been transferred to England and admitted to the Second London General Hospital, Chelsea. After rejoining his regiment, oh so briefly, more transfers followed – to the New Zealand General Hospital at Brockenhurst, to the New Zealand Convalescent Hospital at Hornchurch, and finally, seriously ill, to the No. 3 New Zealand General Hospital at Codford, on 7 February 1917. It was at Codford that Job Jefferies, Canterbury Infantry, died of lobar pneumonia on 12 February 1917, his mother receiving such advice soon after. He was buried at Codford St Mary New Churchyard, Codford, Wiltshire, England. The New Zealand Command Depot was established at Codford in June 1916 and the No.3 New Zealand General Hospital followed in July. The new churchyard was established by deed of gift as the Military Burial Ground, with a small part reserved for future burials from the parish. The war graves plot contains 98 burials, mostly of New Zealand (66) and Australian servicemen. His father William was the recipient of his medals – 1914-1915 Star, British War Medal and Victory Medal – and the plaque and scroll. His parents were buried at little Wanganui Cemetery but may have been reinterred at Karamea following sea erosion at Little Wanganui. Job and his brother William are honoured on the Westport War Memorial. This memorial which is inscribed “Gates of Remembrance” and includes a tablet bearing the names of fallen soldiers, was unveiled on 3 June 1922. After an address by Lieutenant-Colonel Mitchell, the bugler played the “Last Post”, accompanied by the tolling of the fire bell. The “Dead March” was played by the Garrison Band and the National Anthem followed before returned soldiers (perhaps brother Harry) and the general public walked through the gates. His eldest brother, Private William Jefferies, was reported missing in action 2 - 24 May 1915. He was probably killed on Dead Man's Ridge (Pope's Hill) in an attack on Baby 700. Another brother, Charles Henry Jefferies (Harry), who gave well over four years of service in World War I, was also wounded at Gallipoli. A younger brother, Albert Jefferies, a drainer of Kongahu, Westport, who was drawn from the West Coast Recruiting District in the second Military Service ballot, in December 1916, was given three months leave. 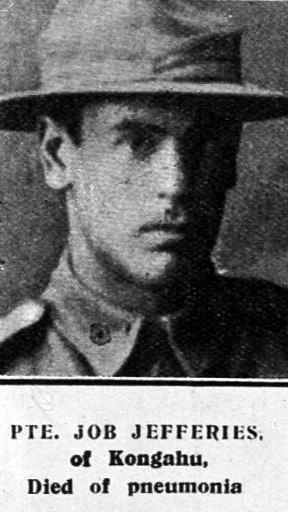 A photo of Private Job Jefferies, of Kongahu, is attached to the Auckland War Memorial Museum Cenotaph Database, and another was printed in the Otago Witness of 16 August 1916.